Come race this stunning, athletic filly by proven stallion Turffontein out of the black type winning mare Inkster, purchased from the recent Inglis Premier Sale. This well conformed, Super VOBIS & VOBIS Gold eligible filly is a half sister to the very promising 2YO Des Moines, who ran a close up 3rd on debut at Caulfield. She has been nominated for several feature races this Autumn including the $1m Group 1 Inglis Sires & the Percy Sykes Stakes. The dam Inkster was a 5 time winner and talented staying mare who took out the Listed VRC St Leger and placed in a Group 3 Sth Australian Oaks in her short career. Inkster has also produced multiple placegetter Waynes County (Redoutes Choice) and the winner Almancil (Encosta De Lago) from her foal crop to date. 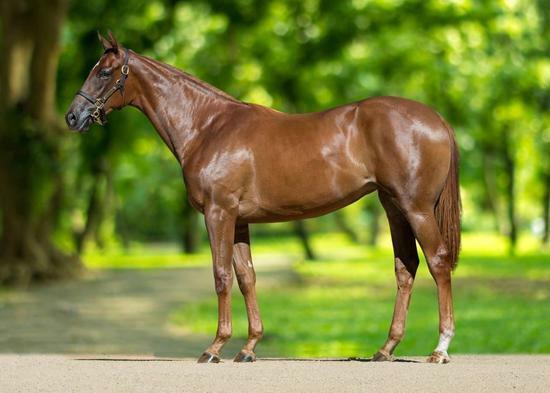 The female family is full of talented fillies and mares, including multiple city winner and group placed Sorenstam and seven time winner Deltrice and this filly is sure to have great residual value as a broodmare after racing. Turffontein has proven to be a versatile stallion boasting a Group 2 juvenile winner in Fontiton and prolific winner and VOBIS pin up boy Widgee Turf. TURFFONTEIN (AUS) (Chestnut 2004-Stud 2010). 5 wins-1 at 2, MVRC William Reid S., Gr.1. Sire of 201 rnrs, 108 wnrs, inc. SW Fontiton (MRC Blue Diamond Prelude (f), Gr.2), Fontein Ruby, Widgee Turf, Lyuba, Bold Thruster, SP Turfane and of Alinjer, Mandela Effect, Turf Man, Fontein Lad, Faint Blaze, Finke, Safariann, Give Us a Go, Hunters Grace, Turf Crusher, Eskdale Girl, Crown Fontein, Meet Mr Taylor, Central Pass, Constantine, etc. Wayne County (g. by Redoute's Choice). Winner at 1350m in 2017-18 in Aust. Canford. 3 wins at 1350m, 1550m, A$79,700, to 2018-19, SAJC Ubet H., Terry Howe Printing H., 3d SAJC Hughes Limousines H.
Wimborne. 4 wins from 1200m to 2050m, A$97,005, to 2017-18 in Aust. Tillation. 5 wins to 1200m, TTC E (Ted) Cox Memorial H., 3d TTC Jobnet Tasmania H.
Keltah (Keltrice). 9 wins from 1200m to 1800m, A$163,657, SAJC Scott Group of Companies Quality H., Simply Containers H., Billson Sawley Architects H., Flight Centre H., Mick Dermody Memorial H., Holdfast Insurance Brokers H., 2d Balaklava Cup, L, 3d SAJC Christmas H., L, 4th SAJC CMA Recycling S., Gr.3.